Malaysia Dairy Industries Pte Ltd (MDI) is incorporated as a joint venture between Singaporean partners and the Australian Dairy Produce Board. Singaporean partners of MDI purchase Australian equity, resulting in total localisation of MDI. Manufacture of evaporated milk begins, making MDI the first company in Singapore to do so. Manufacturing line expands to include pasteurised products. VITAGEN is re-launched to VITAGEN Less Sugar. MDI is a leading dairy and beverage company with a wide range of products including MARIGOLD HL Milk, MARIGOLD PEEL FRESH and VITAGEN. MARIGOLD HL Milk is Singapore’s No. 1 Pasteurised Low Fat Milk. MARIGOLD PEEL FRESH is Singapore’s No. 1 Pasteurised Juice. 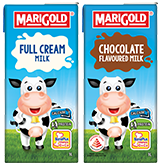 MARIGOLD UHT Milk is Singapore’s No. 1 UHT Milk. Annual sales revenues in Singapore exceed $260 million. Annual sales revenues in Malaysia exceed RM600 million. We manufacture, distribute and market a wide range of food products such as sweetened condensed milk, evaporated milk, pasteurised milk, juices, cultured milk and yoghurt. In addition to serving the domestic market, we export 90% of our manufactured output of sweetened condensed milk and evaporated milk to more than 50 countries worldwide. We look to continue our innovation of pasteurised milk and juice products; proactively responding according to your needs. We hope to bolster our position as the industry leader by developing new products and expanding into new geographical markets. Since our inception over 50 years ago, we have grown to become the largest dairy producer in Singapore. Our VITAGEN Less Sugar brand is the first and only locally-manufactured cultured milk drink in Singapore. Today, MARIGOLD and VITAGEN Less Sugar are household names, with consumers recognising them as valued and trusted brands. All MARIGOLD and VITAGEN Less Sugar products are halal-certified. A great number of our products have achieved the No.1 brand status in Singapore. They represent the best-selling products in their respective categories. ISO 9001:2008 certified for quality management systems.